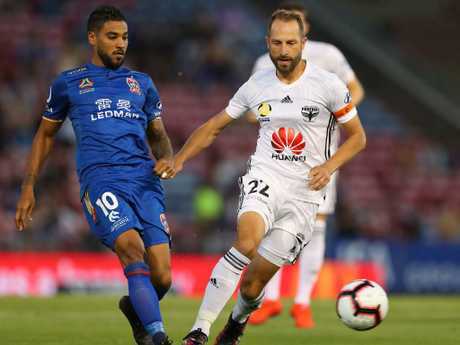 Andrew Durante has become an A-League stalwart. 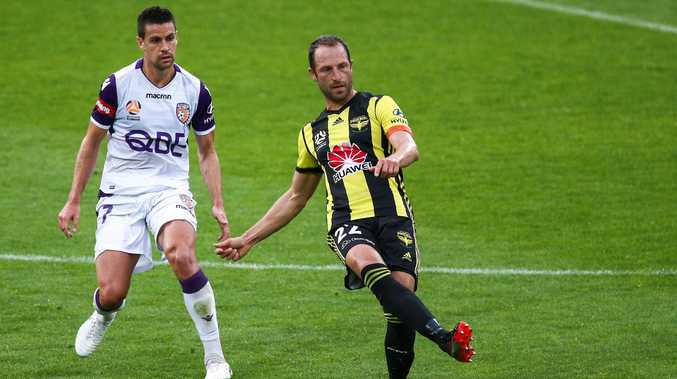 WELLINGTON Phoenix captain Andrew Durante has opened up on the incredible moment he was shot in the chest on the sideline during a football match 20 years ago. Durante had been substituted from the field during a trial match for Sydney Olympic's reserve team in 1999 when a teammate noticed blood stains on his white playing shirt. "My dad lifted up my shirt and I had this blood dripping down my chest and he was like, 'You've been shot'," Durante said. "Then obviously there was a bit of a frenzy and everyone was screaming, 'He's been shot, he's been shot'. Durante was just 17 when the bulloet from a .22 calibre rifle pierced his skin at Mahoney Park in Sydney's inner west and though he escaped without any serious injuries, he said it was still a traumatic experience to go through. Andrew Durante survived the incident to carve out a stellar career. "I was thinking the worst," Durante said. "It came through my chest but on an angle and the bullet lodged under my armpit. "I could actually feel it lodged under there so the doctor gave me a local (anaesthetic), did an incision and pulled it out. I think it was a .22 calibre rifle. There was a big inquiry, the police got involved. "It wasn't a real big setback in my career, I got stitched up and played a week or two later. "For sure if it went straight on or on the opposite side maybe I could have died. Going on that angle it probably saved me a lot of other complications." The story resurfaced on Twitter last weekend when Mark Boric posted a photo of a news article that was originally published in the Australian and British Soccer Weekly when the incident occurred in 1999. Durante said police never found the perpetrator but that another shooting had been reported at a neighbouring golf course earlier that day. "There was probably just some idiot up there shooting from his house or up on the street taking random pop shots at people," he told Stuff.